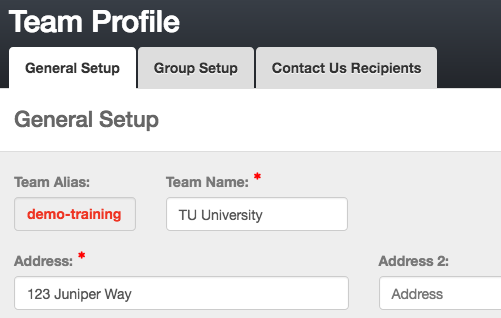 Your Team Profile is where you set up all your basic team info, age up date, custom labels, and more. Chameleon users: In the side menu click Team Admin > Team Profile. New CMS users: In the side menu click Business Tools > Team Profile & Settings. Team Alias—This uniquely identifies your team within our system. It is part of your TU URL to allow people to access your site. Your team alias cannot be changed. Team Name and contact info—This is what we use to identify and stay in touch with you, especially for billing, so please keep it current. Organization and LSC/Region/League—Identifies to which sports organization your team belongs. Please let us know if this ever needs to change. Team Club Code and Unattached Team Club Code—Used when generating meet entries and when importing meet results. These are used by TouchPad and Meet Manager to identify which entries and results belong to your team. Make sure to contact TU Support if you ever need to change your club code so we can update all your meet results. We strongly recommend setting the Unattached Code to UN if you are a USA Swimming team. Use Relay Lead-Off in Meet Entry—This is typically determined by your swimming organization. Use setting defined in Results By Meets page—By default, results loaded are set to Hide relay lead-offs. This means when the Meet Entries module is searching for seed times to use from Meet Results, it will ignore relay lead-off times when the entire results file is set to Hide. You can change that by checking the box by one or more results sets and clicking Show/Hide Lead-Off Records. Always Use Relay Lead-Off in Meet Entry and Do NOT Use—Ignores whatever setting is in each set of meet results and either use or don't use relay lead-off times for entry times. Display Member Ages—In any place the system displays a member's age, such as in Account/Member Admin, it will use this setting. In most cases you will select Show real age. But some leagues go with a global date and age up everyone to how old they will be on that date. In that case, select Show age-up age as of and enter that date. Contact Request creates new Account—When someone clicks Contact Us on your site and submits their information on the form, it will send their information in an email to those you designate under Contact Us Recipients (see below). For some, that is enough. If you set this setting to Yes, it will also create an account in Account/Member Admin with the information they filled out and an Account Status of Contact Request. You can then filter by that status and email those who have filled out the Contact Us form. Account Custom Field Label and Member Custom Field Label—You may define a custom field for each Account and Member in your system. These are available in Registration and Account/Member Admin. Swim Lesson Button—Only teams with TULessons will see this option. This lets you label the Swim Lessons tab under the Sign In button or System menu on the side however you like, such as "Sign Up for Swim Lessons" or "Swim Lessons Registration." If you leave it blank, it will default to Swim Lessons. LSC/Region/League for Meet Entry Export—This only appears for rec teams. If your League uses a LSC/Region/League code in Meet Manager other than the one assigned to your team by TU (see #3 above), enter the one used by your League and it will be used in meet entry files you generate. If your League does not use a Region code at all, enter None. FTP Password for Live Results—If you use Meet Manager's real-time results feature, enter the Password used, and enter it again in the Confirm field. Domain—As described on-screen, enter the URL used to access your TeamUnify site. This will appear as a clickable link in emails you send from the system. If you purchased a custom domain, you may enter that instead of your default TU URL. Make sure to leave off the "http://" part. Customize Available T-Shirt Sizes—These are the shirt sizes available for people to select in both registration and member profiles. Check the boxes of the ones you want to make available. To add a new size, click the green (+), enter the size name and click Add. Click the trashcan by a size to delete it. This only works if no one has selected it. Otherwise you must assign a different size to those using it before you can delete it. How do I create a meet/time in the TU database?